When it comes to achieving a lifelong dream, age is certainly no obstacle for Tan Sri Jins Shamsuddin, 75. After two years of hard work and commuting between Kuala Lumpur and Sintok up north, he finally obtained his PhD last Saturday at Universiti Utara Malaysia's 23rd convocation. For his doctoral thesis he researched 50 Malay films from the 1930s to 1960s. Not a surprising choice of study considering his wealth of experience in acting, directing and producing movies over a career spanning more than 50 years. In his first film in 1956, he was directed by Malaysia's legendary P. Ramlee. Not many Malaysian celebrities can claim that honour. 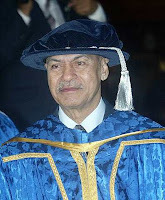 Must have been a challenge for UUM to find a capable academician to supervise Dr Shamsuddin's thesis. 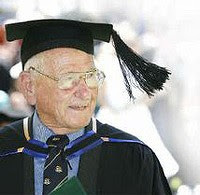 The world's oldest student is currently Allan Stewart of Newcastle, Australia. The retired dental surgeon first came into the public spotlight when he made it into the Guinness Book of Records as the oldest graduate at 92, graduating with a Bachelor of Law degree. Now at 95, he has a year to go before he gets his Masters of Clinical Sciences. His field of study - the ageing process. ''This is a great degree for me to study, not only because I get to research my passion, which is natural health and healthy aging, but also because it is so convenient to be able to study via distance education which is a more flexible study option for older people like me,'' he said. Age is no barrier in the pursuit of knowledge. However, knowledge is no substitute for age & wisdom. Couldn't agree with you more! Knowledge is limitless. No one can lay claim that he knows everything there is to know. But knowledge by itself is of little value unless it is shared or applied. So this blog really doing great for me. For genuine Degrees and diplomasvisit this site. Register fast to avial discounts. WOULD YOU EAT ANYTHING IN THE NAME OF HEALTH?